Traditional Greek Salad recipe or just perfection in simplicity! Take your taste buds to the refreshing flavours of the Mediterranean with every bite of this colourful Greek salad! This traditional Greek salad recipe (Horiatiki) is the brightest example of how Greek cuisine takes the simplest ingredients and with literally no effort transforms them into a finger licking dish! To make this traditional Greek salad recipe keep an eye on your ingredients: find some juicy tomatoes, crisp, fresh cucumber, creamy feta cheese, good quality extra virgin olive oil and some tangy black olives and you are done! So go ahead, make your own refreshing Greek salad with creamy feta cheese with this easy to follow Greek salad recipe and taste all the earthy flavours that characterise Greek cuisine in one dish. If you’ve been looking for a Greek salad recipe (Horiatiki) that actually tastes like the one served in Greece, then you have to try this authentic Greek salad recipe. A lot of Greek salad recipes include leafy greens, such as lettuce, cabbage, beets, radishes or even potatoes, while others suggest to coat with prepared dressings containing various herbs and seasonings. But the fact is that this kind of ‘Greek salad’ recipe is rarely found in Greece. 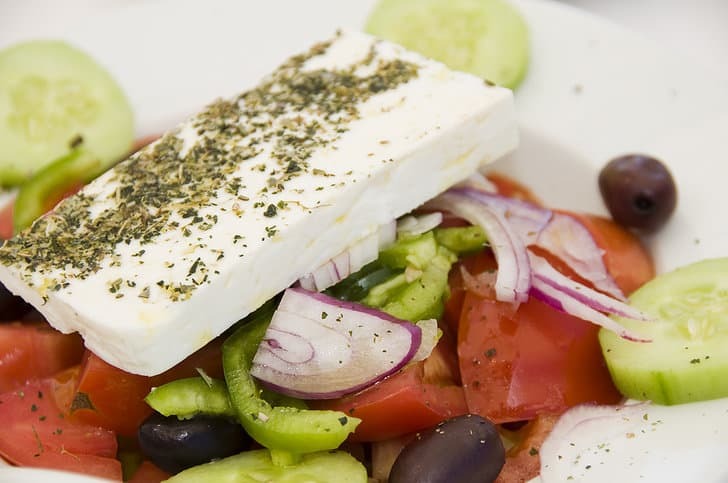 A traditional Greek salad recipe (Horiatiki) will always (and only) include tomato, sliced ​​cucumber, green pepper, sliced red onion, Kalamata olives and of course feta cheese. It must be seasoned with dried oregano and salt and dressed with good quality extra virgin olive oil and a splash of red wine vinegar. This is a traditional Greek salad; fresh, locally produced ingredients, simple and uncomplicated. Enjoy! To make this Greek salad recipe (Horiatiki), start by preparing your vegetables. Wash thoroughly and strain the vegetables. Cut the tomatoes into wedges, slice the onion into thin rings, cut the cucumber in thick slices and place everything in a large bowl. Don’t forget to add the olives as well. Season with salt and pour over the extra virgin olive oil and vinegar. Toss everything together, so that the flavours mix. Be careful not to add too much salt, as the feta cheese and the olives are salty enough. Greek salad (Horiatiki) is always served with feta cheese on top, a drizzle of olive oil and dried oregano. Enjoy your delicious Greek salad as a side dish or as a light summer meal with lots of crusty bread aside! The Greek diet keeps men virile, women happy and kids healthy. Could you ask for more? Well, yes. Mythos, the eponymous Greek Beer. Thank you Eli, from a fan of your recipes. I am an English man with an Irish mother, who is so proud to have been asked “are you sure your father wasn’t Greek?” Happy New Year Eli. Thank you Phil for the compliments and kind words! Happy new year to you, your family and loved ones too! The instruction “1 cucumber, pilled and sliced into thick half-moons” mystified me until I looked at the photo and inferred that by “pilled” you meant “peeled”. But the photo doesn’t seem to show half-moons, they all look like full-moons to me. Also, I’m wondering how large you think the cucumber should be; they come in so many different sizes. Thank You Dude for this great articles. I hoop this will be benefit for all time. What Is My Target Heart Rate Zone For Fat Burning? I made this recipie for the dressing, and instead of lettuce I used avacodo halves. I saw a picture on the internet and I thought I’d try it. You must try it if you’re trying to get more veggies into your diet. I made this tonight as a topping for baked potatoes. I avoid lettuce like the plague as one time in a fancy restaurant a little green worm crawled across my plate. The staff thought I was nuts (I am!) when I took the worm outside and put him a flower planter.